Lone Crow Bungalow (formerly known as Bend Bungalow) was born in Bend in 2001 and has been capturing the hearts of downtown shoppers ever since. If you love all things American Bungalow and a hint of Northwest, this boutique will have you at hello. Even the name perfectly describes the experience of shopping here. Lone represents the store’s singular style focus and their unwavering attention to quality and customer service. Crow characterizes the curious, playful, clever nature of the black birds, as well as the delightful range of items you’ll find in the store; gorgeous blankets and textiles in touchably soft textures, artisan-made candles and soaps in scents inspired by nature, hand-painted tiles and pottery, beautiful, whimsical jewelry made by artists near and far, small leather goods, nostalgic travel posters, and so much more. Linger for just a bit and it’s easy to see why this boutique has been featured in Sunset Magazine and Cottage Living. The friendly staff is helpful but never hovers, and they will gladly gift wrap your purchase or place a special order if what you would like is not in stock. 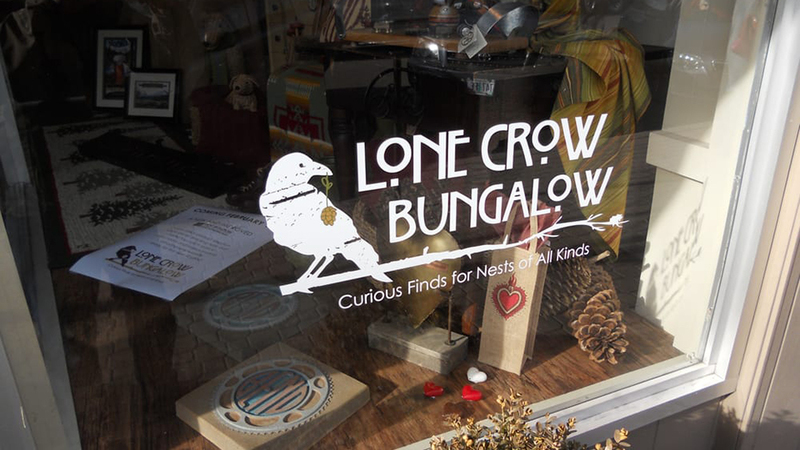 Lone Crow Bungalow is open Monday through Saturday from 10:00 a.m.-6:00 p.m. and Sundays from 11:00 a.m.-5:00 p.m. You can also shop online anytime and discover “Curious finds for nests of all kinds”…including yours.